Bike to School Month, Parents Who Ride Rule! I would like to applaud all of the parents who are taking their kids to school by bike this month. You are all doing a fantastic job. Way to go! Getting elementary school children to school on time is no small feat. Everyone must be fed, dressed, brushed, lunched, packed up and shod (for some reason kids can never seem to find their shoes. Our five year old has run out the door on more than one occasion without shoes on his feet. Go figure.) All of those things packed into a small window of time is quite an effort and is 100% up to the parents. For all of you bike-to-school-parents, now you must add bikes and helmets to your morning routine. This gets easier and effortless as time goes by. And It beats firing up the car to drive a mile on any given day. You just have to do it often and make it a part of your routine. The reduction in traffic around our local elementary school is noticible. Removing 15 or so cars off the automobile-clogged-neighborhood streets every morning and afternoon really makes a difference. I’ve seen multiple parents, who don’t normally ride, donning helments and looking quite happy this past week. Hopefully you’ll get addicted to riding and keep it up year round. Kids used to walk and ride bikes more. 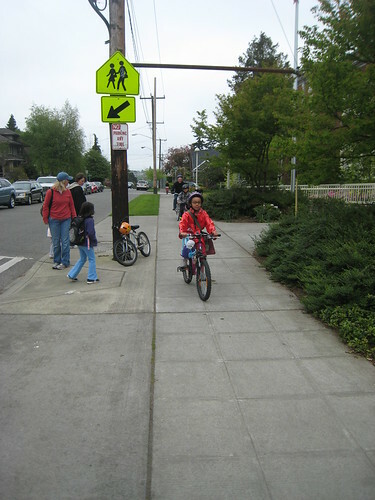 According to the Bicycle Alliance Safe Routes to School page, 13% of American children walk or ride their bikes to school these days, compared to more than 66% 30 years ago. Let’s all work together to get those numbers back up! I’m thankful my kids don’t go to Bridgewater-Raritan High School in New Jersey with it’s anti biking policy. Students are fighting administration for the right to bike to school. They even raised $2000 for a bike rack and aren’t allowed to install one. But I still dream that someday going to school in our little corner of Seattle will be like this? Parents, it’s up to you to make it happen! This entry was posted in alternative transportation, bikes, Human Powered Politics, kids, neighborhoods, seattle and tagged bike-to-school, bikes, Family Cycling, kids, parents. Bookmark the permalink. Thanks for that video. It brought back good memories of bike riding in Holland. I’d forgotten how parents often ride with their hands on the kid’s shoulder. It’s so sweet. And the controlled chaos. It looks scary but it all makes sense if you know what you’re doing. I’ve tried to guide my kids like they do in the video and I have to say – it’s not easy. The one time I tried it, I ended up guiding my daughter into some shrubs and she was not happy about that. They make it look so easy in the video! I know! Those Dutch make a lot of things look easy on a bike. I definitley wreaked havoc on my bike more than once trying to do something I should *not* have been doing. Thanks cafn8: My _favorite_ thing about that article is that they had no problem expanding parking so every senior could have a spot! Yes. The annoying thing is that the increased traffic of every car-owning senior driving to school is likely partially to blame for the dangerous conditions. Granted, I don’t know the area, but I do know from experience that when you ring a bell and release dozens of inexperienced drivers all at once, you are not necessarily contributing to safe road conditions.